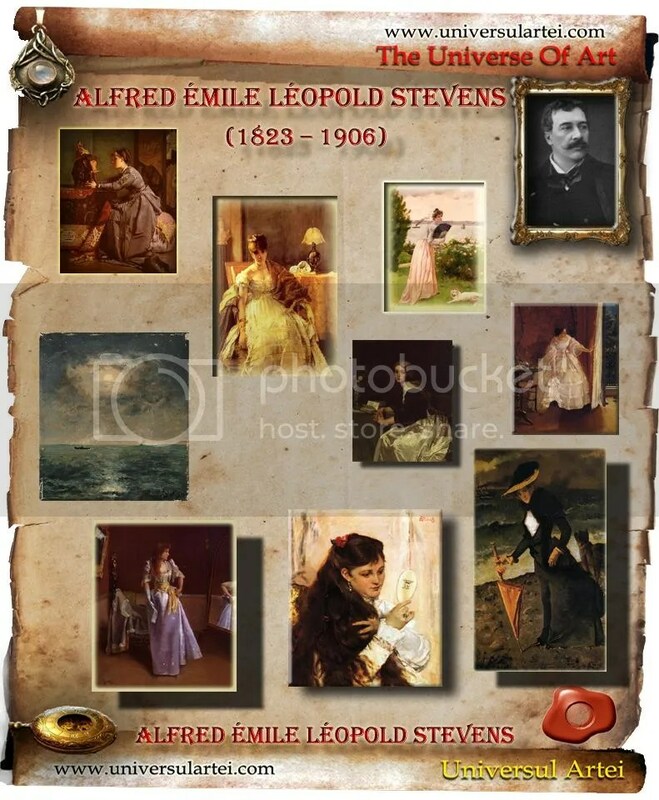 Alfred Émile Léopold Stevens was a Belgian painter. 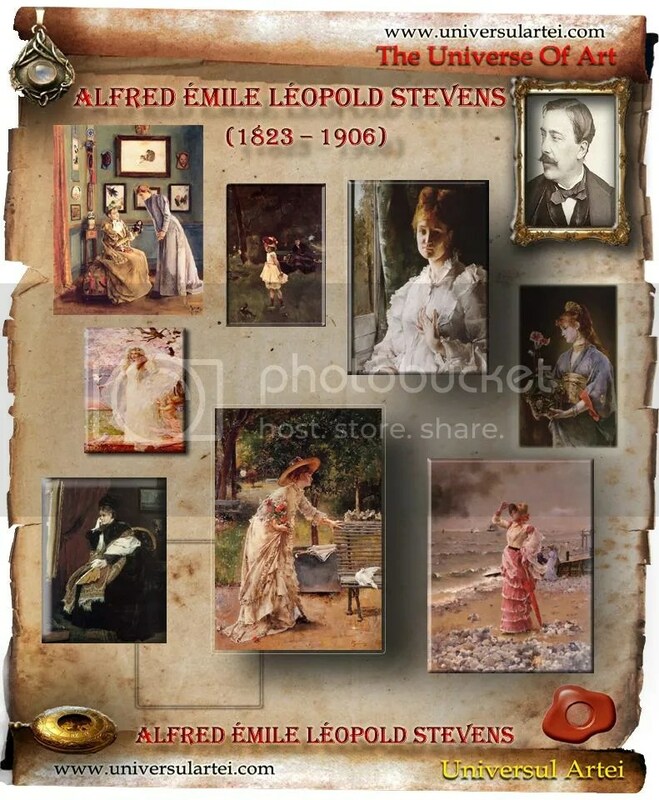 Alfred Stevens was born in Brussels. He came from a family involved with the visual arts: his older brother and his son Léopoldwere painters, while another brother – Arthur, was an art dealer and critic.His father was an art collector who owned several watercolors by Eugène Delacroix, among other artists. His mother’s parents ran Café de l’Amitié in Brussels, a meeting place for politicians, writers, and artists. He studied at the Académie Royale des Beaux-Arts in Brussels, where he knew François Navez, the Neo-Classical painter and former student of Jacques-Louis David. There, he drew from casts of classical sculpture for the first two years, and then drew from live models. Later he was admitted to the École des Beaux-Arts, the most important art school in Paris. Stevens’s work was shown publicly for the first time in 1851, when three of his paintings were admitted to the Brussels Salon. He was awarded a third-class medal at the Paris Salon in 1853, and a second-class medal at the Universal Exposition in Paris in 1855. During the 1860s, Stevens became an immensely successful painter, known for his paintings of elegant modern women. His exhibits at the Salons in Paris and Brussels attracted favorable critical attention and buyers. An excellent example of his work during this time is La Dame en Rose or Woman in Pink (Musées royaux des Beaux-Arts de Belgique, Brussels), painted in 1866, which combines a view of a fashionably dressed woman in an interior with a detailed examination of Japanese objects, a fashionable taste called japonisme of which Stevens was an early enthusiast. The single most important work from the second half of Stevens’s career is the monumental Panorama du Siècle, 1789–1889, which he painted with Henri Gervex. Stevens painted the women and details and Gervex the men, with the help of fifteen assistants. In 1900, Stevens was honored by the Ecole des Beaux-Arts in Paris with the first retrospective exhibition ever given to a living artist. Alexander Pavlovich Brullov was a Russian artist; it was associated with the latest phase of the Russian Neoclassicism. His name was spelled Brulleau until 1822, when the family name was changed according to Russian pronunciation, sometimes also spelled Brulloff. 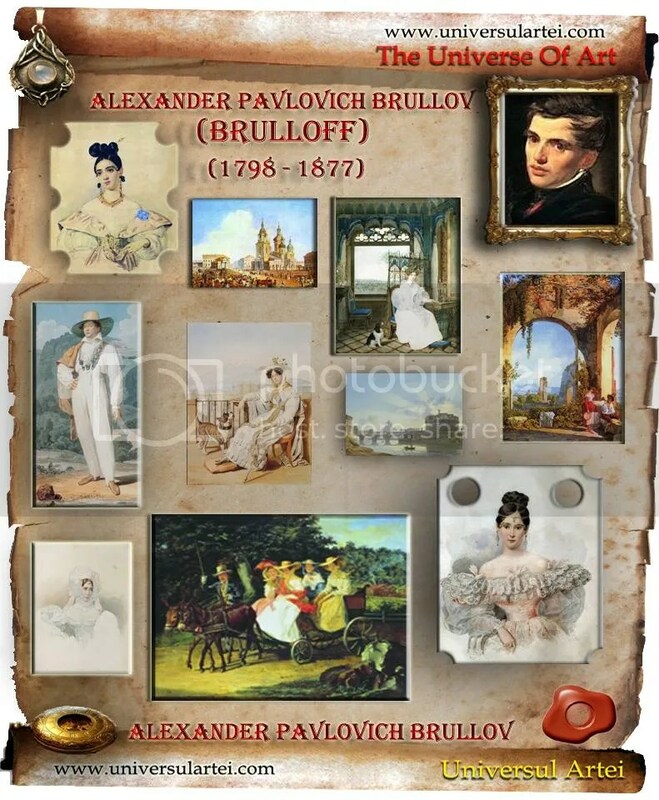 Alexander Brullov was born in Saint Petersburg into a family of French artists: his great grandfather, his grandfather, his father and his brothers (including Karl Brullov) were artists. His first teacher was his father Paul Brulloff. After he attended the Imperial Academy of Arts’ architect class from 1810 to 1820, and graduated with honors, was sent to Europe to study art and architecture as a pensioner of the Society for the Promotion of Artists. He spent eight years abroad from 1822 to 1830, in Italy, Germany and France, studying architecture and art. He painted a lot of watercolor portraits at that time. In 1831, after his return to Russia, he was appointed professor of the Imperial Academy of Arts and these were the years when he created his best architectural projects. Among others, he designed and built the following buildings in St. Petersburg: Mikhailovsky Theatre (now Maliy Theater, 1831–1833), Lutheran Church of Saint Peter and Saint Paul on Nevsky Prospekt (1833–1838), Pulkovo Observatory (1834–1839), the Headquarters of Guard Corps on Palace Square (1837–1843). He was one of the main architects of the reconstruction of the Winter Palace after the fire of 1837. He designed many striking interiors there including the Pompei Hall, the Malachite Room, and the White Hall. Alexander Brullov was also talented painter. One of the best portraits created by A. Brulloff at this period was a portrait of Natalya Goncharova-Pushkina. (1831), wife of the Russian poet Alexander Pushkin. Alexander Brulloff also made illustrations for the books and magazines. Alessandro Turchi was an Italian painter of the early Baroque. He was born and active mainly in Verona, and moving late in life to Rome. He also went by the name Alessandro Veronese or the nickname L’Orbetto. Turchi initially trained with Felice Riccio (il Brusasorci), in Verona. By 1603, he is already working as independent painter, and in 1606-1609, Turchi paints the organ shutters for the Filarmonica Academy of Verona. 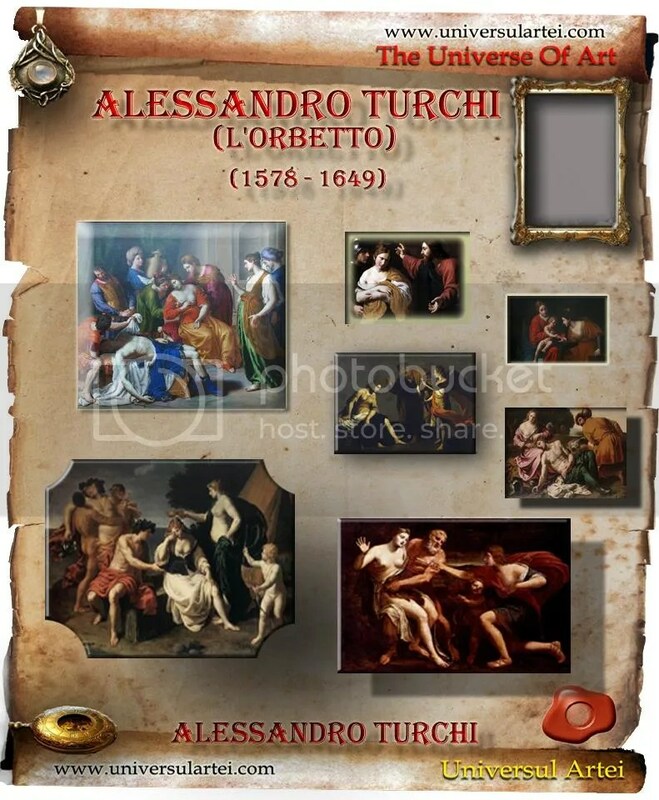 After the death of Brusasorci, in 1605, Turchi and Pasquale Ottino complete a series of their deceased master’s canvases. In 1610, he completes an Assumption altarpiece for the church of San Luca of Verona. In 1612, the Veronese Guild of the Goldsmiths commissions from Turchi an altarpiece, today lost, of the Madonna and Saints. On leaving the school of Riccio, he went to Venice, where he worked for a time under Carlo Cagliari. Turchi participated also in the fresco decoration (Gathering of Manna) of the Sala Reggia of the Quirinal Palace, and painted for cardinal Scipione Borghese – a Christ, Magdalen, and Angels. He painted also some pictures in the church of Santa Maria della Concezione dei Cappuccini. He also painted a Flight into Egypt for the church of San Romualdo; a Holy Family for S. Lorenzo in Lucina; and a S. Carlo Borromeo in S. Salvatore in Lauro. He was much employed on cabinet pictures, representing historical subjects, which he frequently painted on black marble. 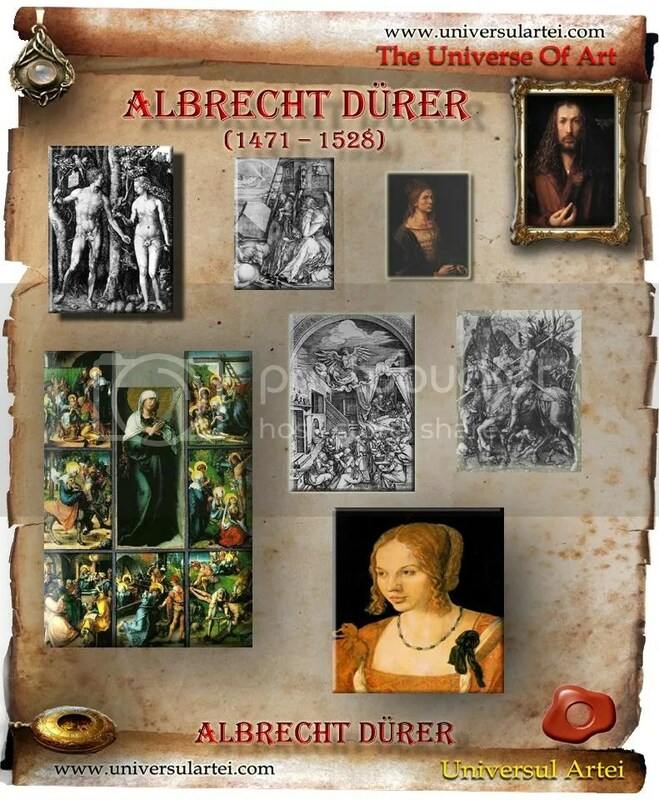 Albrecht Dürer was a German painter, engraver, printmaker, mathematician, and theorist from Nuremberg. He has been conventionally regarded as the greatest artist of the Northern Renaissance because of his high-quality woodcuts (nowadays often called Meisterstiche or “master prints”). His well-known prints include the Knight, Death, and the Devil (1513), Saint Jerome in his Study (1514) and Melencolia I (1514). His watercolours also mark him as one of the first European landscape artists. Between 1507 and 1511 Dürer worked on some of his most celebrated paintings: Adam and Eve (1507), The Martyrdom of the Ten Thousand (1508, for Frederick of Saxony), Virgin with the Iris (1508), the altarpiece Assumption of the Virgin (1509, for Jacob Heller of Frankfurt), and Adoration of the Trinity (1511, for Matthaeus Landauer). During this period he also completed two woodcut series, the Great Passion and the Life of the Virgin, both published in 1511 together with a second edition of the Apocalypse series. Between 1513 and 1514 Dürer created his three most famous engravings: Knight, Death, and the Devil (1513, probably based on Erasmus’s treatise Enchiridion militis Christiani), St. Jerome in his Study, and the much-debated Melencolia I (both 1514). Dürer’s work on human proportions is called the Four Books on Human Proportion (Vier Bücher von Menschlicher Proportion) of 1528. There is a point (thesis). The point is well supported with persuasive details. The needs of the audience have been addressed. The paper is well organized. How does it affect the viewer’s reaction to, or relationship with, the piece? Why was it made? What is its purpose? If it’s a portrait – does it portray an individual or a social type? What aspect of the sitter’s personality is expressed? If there is a figure, what is its gaze as it relates to the gaze of the artist or viewer? What is the relationship between the parts? What is the medium, color, scale? What techniques did the artist use? Are there any connections with earlier art history – or history in general? What is the artist’s philosophy? Does the piece appear as it was originally constructed? Where is the main subject in relation to the foreground, background and middle ground? If it is a still life, what does the artist focus on, technique, composition? In a landscape, is there any human interaction with the land? Whose view of the natural world might the artist have represented? Is there a pose? What does the pose suggest? What does the clothing suggest? Is it heavy or light? Is the piece geometric? Irregular? In silhouette? If you are looking at a bust, note the truncation? Why would the sculptor chose to stop there? Is there a base? Is the sculpture carved or molded? What is its texture? Does it reflect the medium or the facture (the process of working on the medium)? Who was the photographer, an individual or a firm? What is the overall focus? What type of development process was used; what kind of paper? On what material is the photograph printed? Has it been tinted, retouched or cropped? Was natural or artificial light used? What is the range of light and dark? What did the photographer chose for exposure time? Are there blurs or motions which indicate the passage of time? Are there any political implications? How is the structural system of a building/monument suited to its purpose? What is the interior hierarchy of spaces? Do they flow, connect well to the exterior? How do you approach the building and enter it? Are there blueprints of the work? Do they change your impression of the building? Please note: reproductions (in books or slides) offer little sense of the actual size and texture of the original. If possible, make an effort to see the work you are writing about or ask your professor to recommend a good book or website. The information in this handout is excerpted from A Short Guide to Writing about Art (8th ed. ), by Sylvan Barnet. –The Writing Center thanks April Freely, Emma Rainey, and Emily Weirich for contributing this handout. This is an article found across a website, concerning “Preparing Supports for Acrylic Painting” ; I requested a permission for publishing it, but was already re-published; the website would have loved to re-publish the article and with that occasion I must thanks them for their good intention of promoting art and what is related with it. However, I invite you then to come for a while on their website and see what is all about in the article, as I find it very useful for those interested into Acrylic Painting.